FURY is a movie that probably gives us the most realistic depiction to date of what is must have been like to be inside a tank in World War Two - the claustrophobia, dirt, fear, and almost obsessive need to trust in your fellow soldiers to get you through. It's because of this realism and grit that you remain captivated despite the somewhat hyperbolic set-up of the film, in which a single US tank attempts to hold off of an entire Nazi regiment. The set-up of the film is hackneyed through and through. Brad Pitt plays the war-hardened, uber-experienced tank commander, "Wardaddy" contrasted with Logan Lerman's nervous rookie Norman Ellison. This is exactly the set-up we've gotten from director David Ayer's own TRAINING DAY as well as movies like GRAVITY. 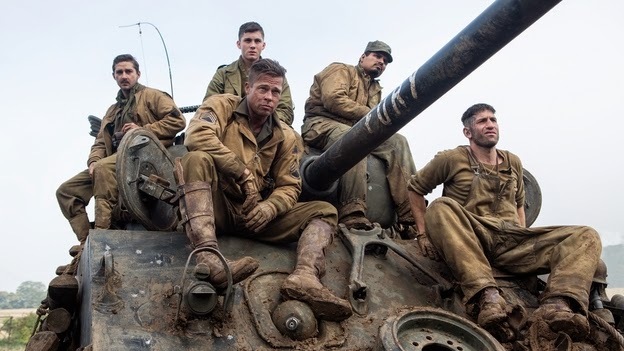 The other three members of the tank crew comprise Shia LaBeouf's religious Gunner Swann, slack-jawed yokel Travis (Jon Bernthal) and dips driver Garcia Michael Pena. In Act One we see our boys and their Yankee brethren retake a German town. Act Two sees our boys share a dinner with a pair of German ladies. I think the director wanted it to be full of menace and tension and unsaid meaning but instead it just feels too contrived, patronising and ultimately getting in the way of the real story - which is the relationship between the men and their tank. In Act Three, the men are sent behind enemy lines by their commander (Jason Isaacs) and we get into the claustrophobia and extreme peril of tank warfare. This is what we've paid to see - the utter commitment of the production to show us the horror of war in genuine World War Two tanks with the highest quality of military advisor. The resulting film isn't perfect but it is affecting and gives us something genuinely new in war films. It also gives us Shia LaBeouf in his most winning performance in quite some time - a hopeful thought in a film so devoid of hope. FURY has a running time of 120 minutes. The movie played London 2014 and is on release in the Bahamas and the USA. It goes on release on October 22nd in Belgium, France and Singapore; on October 23rd in Australia, Hong Kong, Croatia, Hungary, the Netherlands, New Zealand, Portugal and Thailand; on October 24th in Estonia, the UK, Ireland, Iceland, Cambodia, Lithuania, Latvia, Norway and Sweden; on October 30th in Azerbaijan, Kazakhstan and Ukraine; on November 13th in the Czech Republic, Denmark, Italy; on November 14th in Spain, India and Vietnam; on November 29th in Greece; on December 5th in Kenya; on January 1st in Germany; on January 15th in Argentina; and on February 5th in Brazil and Peru.